I don't usually try to write sensational headlines. However, I don't know how else to put it. Jake put in about 1 hour of work and has now earned $379.51 directly from that work…in the past 30 days. I want to show you exactly what he did and how you can do the same with your own websites. This is a strategy that isn't particularly hard to implement; however, in the past it has been extremely time consuming. However, Jake has been using a brand new software tool (which I created) that makes this job that normally can take hours to only a few minutes. The software tool is Table Labs, which you can learn about here. Before I go any further, I want to share the “money shot”. Jake has provided this screenshot from JUST ONE of his Amazon affiliate tracking Ids. This tracking ID was set up specifically to track this strategy, so we know with 100% certainty that all the additional earnings he is seeing come from this new tactic. We have all probably heard the term, “money articles”. These are the articles that target buying keywords like “best survival knife” or “best can opener” that are obviously related to products that people want to buy. These articles are easy to monetize and typically is where most of our Amazon affiliate sites are going to make money. However, if you are smart, you also tend to write articles on more informational topics like, “how to shave” or “how to stop biting fingernails”. Informational articles can sometimes be easier to rank for and can often have lots of traffic associated with them. Unfortunately, many times these informational articles are difficult to monetize. Jake happens to own a site in the home services industry. Without being too specific, it covers common problems that homeowners have that they can often handle themselves, but in many cases they'll hire a professional to come in and do the work. It just so happens that the niche his site is focused on doesn't have a ton of products he can be writing about. As a result, most of his site is made up of informational articles; while only a few are the “money articles”. As a result, he's mostly just focused on pay per click ads to monetize his site (like Google adsense or Adthrive). In terms of traffic, this strategy has worked out pretty well for him! Jake's site was in a similar vein, but he never knew how to monetize these sites outside of pay per click ads…that is until recently. 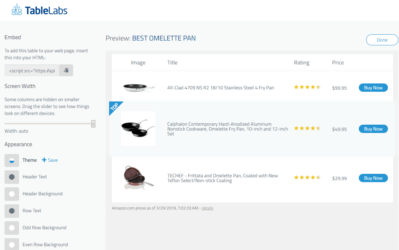 As I mentioned in my last blog post, I've been working on developing a software tool that helps you create beautiful looking product comparison charts in minutes. These charts automatically pull in images, descriptions, prices, and other details from Amazon (hooray for being Amazon compliant!). And of course, it automatically inserts your Amazon Associates ID so you can make money. That tool is Table Labs. Up until this point, he never wanted to go through the pain staking process of creating product comparison tables for each of these articles. As you probably know, creating one table from scratch can easily take an hour or more. When you have dozens or hundreds of articles, that becomes so overwhelming that it never gets done. Once Jake started using my new software tool, he realized that he could create a chart in just a few minutes, without any coding required. To make things simple, Jake used my software to create product comparison tables by category. So in my example above, he would have had a category about stain removal where all the articles about how to get certain stains out of certain garments would be placed. Then, Jake created a table to compare all the best stain removal products on Amazon, and used the Ad Inserter plugin to drop in a subheading of “Top Stain Removal Products” followed by a chart on every post in that category. Since Ad Inserter let's you specify, Jake simply put this chart after the 3rd paragraph of every article in the stain removal category. So as you can see, he was able to create one table and then insert it on dozens of relevant pages within just a few minutes. He followed the same steps for several other categories, so the products he was showing were always relevant to the problem the reader was having. In the end he created 8 tables and put them on about 225 pages of content based on category. 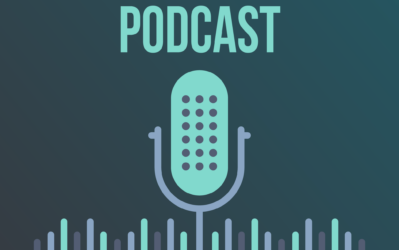 (Up to this point, Jake had earned some Amazon affiliate income, but it was primarily through text links – like when he would mention a product in an article, he'd link to Amazon). For tracking purposes, Jake setup a separate tracking ID that he used exclusively on his new comparison tables so he could see exactly how it affected clicks and earnings. So, before Jake used inserted these charts, he was making $0 from this special tracking ID. After 30 days, this tracking ID made $379.51. Not bad for an hour of work! I thought you might be interested to see an actual table created using my software. So, below I've created a table for you to browse. I'm sticking with the stain removal theme from Jake's example. So, the table below looks similar to the one's Jake used on his site. What About His PPC Ad Performance? You may be wondering how sending more traffic to Amazon affected the pay-per-click ads that Jake was running. Sure, it's nice that his Amazon Associates earnings increased by $379, but did his other ad revenue decrease? Jake recently moved over to AdThrive which is a more managed solution for serving ads, so the sample size here is pretty small. That said, the results might surprise you. August was Jake's first full month using Ad Thrive, and he installed his Amazon tables mid-August. 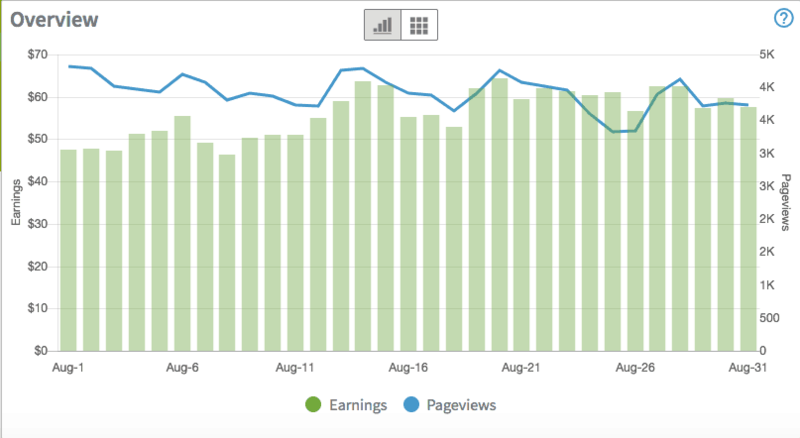 So to get a fair look at how his PPC earnings were affected, he compared August 1 – 15th to August 16th – 30th. In the first half of the month he had 60,429 page views and made $789.28 from ppc ads. From the 16th to the 30th he had slightly less pageviews – 57,424, but actually made MORE money on his ppc ads – $893.60 to be exact. 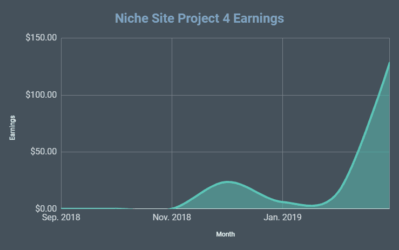 Obviously, we can't say that installing Amazon comparison tables is what caused his pay per click revenue to increase – but if anything, Jake was expecting his PPC earnings to take a little bit of a dip. To see his PPC revenue actually increase while earning significantly more from Amazon was a pleasant surprise. Want More Ideas to Increase Your Amazon Associates Earnings? Jake and I have had quite a bit of experience growing Amazon affiliate websites, and we have a few more ideas that we'd like to share. As a result, on Wednesday (September 20th) at 5pm PST we will be holding a live training workshop! During the training, we will cover a few unique ways we've used to increase our Amazon Associates earnings. One of those ways is using comparison tables of course. Overall, we will dive deep into a few ideas that you might be missing on your websites right now, that can really boost your earnings. And yes, of course I will also be showing off my new software tool for creating comparison tables towards the end of the webinar and give you a chance to be one of the first people to use it. I'll also be offering a REALLY sweet bonus for those webinar attendees that decide to become a user of my new software tool. I'll share more on Wednesday night. As usual, I would love to hear any thoughts or questions that you have in the comments section below. Have you seen good results from using product comparison tables as well? See an alternative plugin here. Any chance of doing another webinar with Europe/UK in mind 1am/2am start for us, or will there be a replay ? I will try to record the webinar for those that can’t make it. 1. How to add html code? I want product names to take people to detailed product reviews instead of Amazon directly. 2. How to add nofollow to the generated buy now button as I don’t want to add a plugin to nofollow all external links. Just want to nofollow Amazon links only. 1. You can’t add your own custom code. 2. The links are all nofollow in the table (doesn’t affect your own links outside the table). 3. We will have an update in a couple of weeks regarding UK. Hi, Thanks to cover this Technique. My question is about to Show Amazon Prices on niche sites. Someone advised me not to Publish Prices otherwise associate account might be at risk. What do you think? If you are not pulling prices and images in using the Amazon API, then correct, your account is at risk as this is against Amazon’s terms of service. However, if you are pulling in prices and images via the Amazon API (like Jake did with my new software tool), then this is totally acceptable to Amazon and not risky. Your understanding is correct. My table software updates the prices automatically from Amazon, so its within the TOCs. Great news on your new software project! Please don’t sell this one! LTP lost its soul once you did. You were the value behind it. Just as Shane is for Thrive, and most owners to their own creation. cool, I would recommend improving the mobile version of that new plugin. When looking at it in a mobile version it isn’t ideal when you look at it, the image gets very small and the columns (title, rating, price) get smushed together . You may want to move around the components a bit, mobile responsive, like changing the title, price and rating on each listing to horizontal instead of vertical. Thanks for the feedback, Charles. While the software is mobile responsive (it does resize to fit better on mobile without scrolling), you are correct that we can do better. And we are indeed working on it…you are seeing a very early version and I’m confident that very quickly you will not only see the perfect mobile responsive charts, but have more options, and more data to help you improve earnings than any other table creation tool out there. Excellent to hear. One of the most disappointing things about my experience with comaprison tables so far is that they look crap on mobiles. If you can nail that, you’ll have a winner for sure. I’ve signed up and am looking forward to seeing your new plugin. nice, i figured about the early on mvp stage, it is just something that i want (and have thought about making) which is a table that is excellent on mobile due to many of my sites/pages having the majority via mobile visitors and what is currently out there, a lot of them anyways, isnt great on the mobile version so that is great to hear, would be great selling point. Are there other uses for this tool? How else could you monetize it, say if you’re not an Amazon associate? This tool is currently only for Amazon associates. Although I suppose you could create your own tables from scratch with the tool unrelated to Amazon products…however, that’s not really what’s it built for. I noticed that Jack is doing pretty well with AdThrive. Do you find it better than Adsense or are you just testing these ads? Also will be tough for me to make that particular webinar time… I’ll sign up though and hope for a replay. Right now it’s built exclusively for Amazon (pull in amazon images, prices, titles, etc.). In the future, I expect that we will expand to make the tool useful outside of Amazon. The product has a lot more features than I was expecting. Definitely impressed with the ability to add to multiple pages and in a set point. The major thing that would stop me buying is the format on mobile. It looks terrible. Over 80% of my traffic is from a mobile device. Also, can you change the colour? I dislike the black background. Yes, you’ll be able to select from a variety of looks for your chart. I’ve also been using these tables on a site that is more product-focused, where I’ve swapped out tables I created using Thrive Themes for these new tables and clicks and sales are up considerably. Let me share my experience for mobile specifically – my old tables you’d only see about a column and a half of the table, then you had to scroll over to see the buy buttons – which wasn’t obvious to the average visitor. These new tables shrink to fit the screen – which I think is the biggest reason my clicks have jumped up pretty sharply. We will nail the mobile aspect, working on it! Yes, you can change the look of the table, this was just one example. There is a need for something like this, however I do think the tables look could be improved, AAWP tables look very professional, it would also be good to add more fields too, such as info about the product, sizes etc. At the moment it feels like a list, whereas a comparison chart/table is more value to the reader and may also convert even better. I also feel this should be a plugin, a monthly or yearly fee doesn’t feel like a good business model for this, well a for a user anyway, you are paying for something to show on your site, however if you wish to sell your site what do you do? If you wish to stop using these tables then all these tables disappear off your site I assume. A good business model for making money but I am not sure I would pay a monthly fee for this. Finally I would be a little worried about trust and privacy, people that use it would be providing you with a lot of data, popular niches, products, sites etc. I really wish this could be combined with something like your own version of EazyAzon, plenty of room for improvement there, a new plugin that has improved features and things like this. I would be more interested in something like that for sure. Mike, this new software allows you to add all the columns and comparisons you want. Want to show sizes, weight, or other fields? Just add the custom column. Its up to you what information you want to input and display. As far as trust, as the admin of the software, I don’t see any of the niches or charts that you create. I can only see the email you used to register and how many charts you are creating (not what those charts are). Mobile is key. If you can make it convert well for mobile, then you will have the best table plugin out there. I look forward to trying it out. Hi Chris – thanks for the comment, just shared my experience (in the comment above) on mobile in this first month or so of being a beta user. The site I’m referring to gets about 70% of the traffic from mobile and our clicks and sales have been up quite a bit after swapping out Thrive tables for these new ones. Hopefully you’ll see a similar bump! Is that tool available to everyone. Or its just a paid tool ? Thank you for the information about adding a comparison table to the site and increasing the earnings. I have a couple of questions. Will there be a monthly cost attached to this plugin or is it a one-time payment situation? Also can you fix the header of the table to the top of the website so that the reader can see the header information as he or she scrolls down the website? Monthly cost. Its not a wordpress plugin, its a much more robust tool that works on ANY website, not just wordpress. I’m not sure I fully understand your fixed header idea…no our software doesn’t currently do that though. Good stuff. Please let me know when the software is available for purchasing. Is this tool available? If not then when it will be published? Will it compatible with WordPress? I got the same traffic to Jake’s site (80% from mobile). Instead of inserting ThriveAds, I’m using Ezoic, but the revenue is just around $35-$40. Anyone has the same problem!? My site is in Health niche. My website mostly consists of many different niches. I basically just write about products I would genuinely use, or have used. I find this makes it easier for me to write content. Is there anything wrong with this? Or should an Amazon site focus on a specific niche? When will the software be out,also,does it adapt with the wordpress theme I use.Is it a one off sale or a monthly subscription? Here’s the software: https://tablelabs.com/. Annual or monthly plans available. Spencer – You say he did 225 pages in 45 minutes, which would mean only 12 seconds for each one, not including the time it took to create the tables. I think something is off about your time estimate. Hi Matt – I can clarify this. I didn’t create 225 tables, it was actually only 8 tables – one for each primary category on my site. Then, I used the Ad Inserter plug-in to say take my one table about stain removal products and put it on all 45 articles I have categorized as “stain removal.” So it was 8 tables, inserted into every page in the appropriate category, which let me quickly add the tables across my site. So it averaged out to about 6 minutes per table I guess. damn I tried this but due the no convertion i stoped it and I’m gonna try the Amazon CPM at least gain some boxes. This sounds like an incredible product. My only concern is using photos from Amazon–doesn’t that go against the Amazon Terms of Service? Hey Matt – Using Photos from the Amazon API is one of the few ways you can use Amazon Photos while remaining compliant with the Amazon Associates TOS. Spencer built this software utilizing the API, so you are safe with this software. Do we lose our tables if we don’t Continue the monthly billing. Hey Brian – you won’t “lose” your tables, but they won’t display on your website without the subscription. The data will be stored though, so if you cancel and come back, you can pickup where you left off. I wasn’t expecting it to be billed monthly. But then, a tool that is sold once usually lose it value over time. People with multiple sites and 100s of money articles, the only option for them is the unlimited plans…….. Yes, in my case the tool literally paid for itself in 24 hours. So that’s really the question – if the time saved + increased earnings is greater than the cost, it’s really a no-brainer. 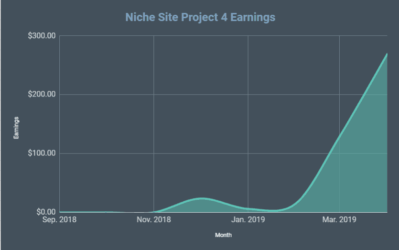 For folks who have niche sites that get traffic but don’t earn a whole lot of money, I think it’s worth testing out Table Labs to see how it affects their bottom line. Nice idea. Defiantly interested – One small issue however… I’ve clicked on the table and for 3 of them the prices on the table don’t match the prices as per Amazon – isn’t this defeating the whole point in the first place? Well done on the results btw – impressive for a site that doesn’t focus hugely on ‘money pages’! Actually, the prices show the lowest prices available (and are accurate). Sometimes “other sellers” have a lower prices available. So, if you click and see the prices for other sellers listed, you’ll see that its the same price listed in the table. So, we always show the lowest possible price of a NEW item from any seller. Hope that clarifies. Wow. You guys inspire me a lot in making a website. I am impressed by your earnings and hoping for the same. Well let’s see how much time it takes for me to get this kind of earnings. 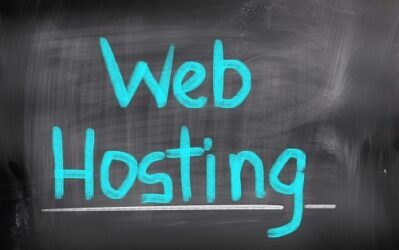 Hi Spencer just quick question about these tables and SEO. As you may have noticed a lot of the “best of” keywords there is a website at position 0 ranking with a table. Would you say this tool has helped you obtain this position more than just any other table? Thanks in advance. The tool is too new for me to say whether its helped me reach position 0. However, the products in the table do indeed show up in Google (gets indexed and keywords used). I don’t think I’ll buy until you fix the price feature. The prices are off in the example table in this post. The tool is available in french ? As a customer, Is it currently possible to remove the ratings and price columns from the admin side of Table Labs? From a user interface perspective this would help a lot as it would then provide more room for the image and title to display. It would be a personal design preference for me so Im hoping that is a current customization feature per the removal of those column. It would also alleviate any of the possible TOS issues since the star ratings and price are sort of grey area. Plus the prices in the example (as several more recent comments have indicated) are innacurate. It would likely turn me into a customer very quickly across all my sites if you would provide clarity on these questions, thanks. Yes, you can easily remove the price and ratings column. Just hover the top of the column and click the trash can. You can delete any and all columns you want, and add any custom columns you want. I am following your blog since long time but yet not comment. But today, you reveal the best strategy to earn few more bucks because most of time we added the cpc ad network and forgot about the affiliate programs like Amazon etc.. But It really helpful to earn extra money into pocket. I checked tablelab. He made a awesome work with professional look. Thank you for introducing for us.. Sounds like a great tool. Thanks for willingness to share your trade secret. Long time follower. I like the tool, but this tools it no a tool that should be a monthly billed thing. It is just a simple wordpress plugin that should be a one time purchase. Can’t get greedy on us.